With the experience of working with various clients and businesses we are able to carry out various types of work with minimal disruption. Ensuring that the job is completed quickly with all relevant certification issued as soon as possible. Electrical work can be complicated, delivering a reputable service with a smile isn't. We are able to offer a innovative service which will save money and eliminates the hassle involved with arranging electrical work. By agreeing discounted rates and outlining our responsibilities in advance we can ensure that any electrical work can be dealt with efficiently. It isn't complicated, there are no hidden fees and no upfront costs. Its simple, by filling in and returning our Maintenance Contract Form, you agree to use Chase Farm Electrical over a fixed period, we agree to discounted rates and you get the service you require. There aren't any hidden catches, it's a promise to deliver a honest, reliable service at a reduced rate. 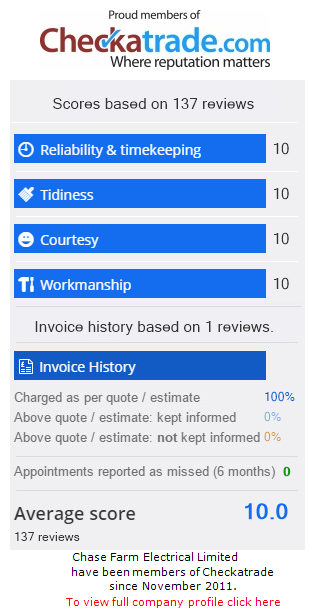 We see the agreement as beneficial to us as we gain a happy customer who will hopefully recommend us to others, and you get the job done in a quick - cost effective manner. Should you have any questions or queries, please do not hesitate to get in touch today.